"Photography with a purpose, for nature's sake." Featuring the fine art photography of James Rodewald. “Seasons of Change." show opens next Friday on February 1. Come join us at IL FARO Italian Restaurant & Bar from 5-7 PM for their First Friday Art Show & Wine Tasting event. All new pieces of the Adirondack wilderness will be on display for the month with 20% of proceeds from art sales being donated to the Adirondack Council. See you there! A special thank you to IL FARO Restaurant for hosting us again this year. Come in out of the cold an enjoy a great meal and some great cocktails, their menu and service is outstanding! A wonderful locally-owned restaurant. “Cascade into Fall.” part of the “Seasons of Change” collection. Sustainable art supporting nature! 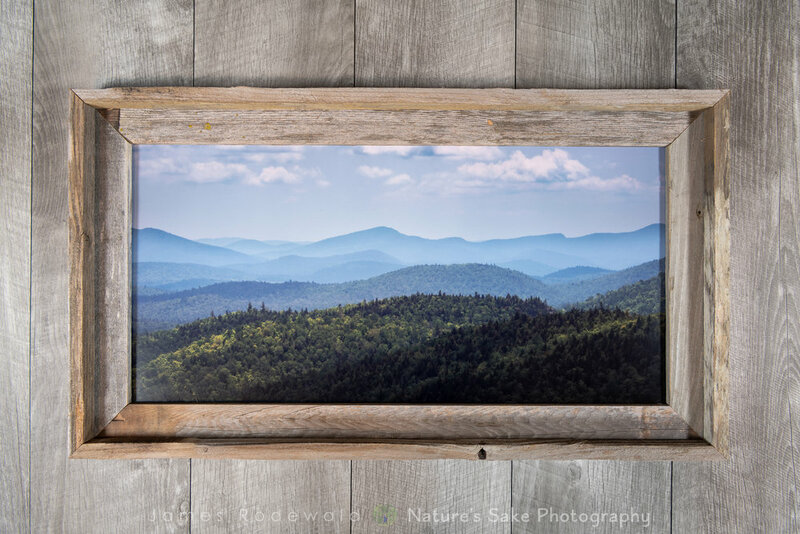 The “Barnwood Frames Project” is a collection of 15 different limited-edition photographs printed on recycled aluminum and framed in recycled barnwood. Each image is limited to 12 prints total and each is beautifully printed on art-grade recycled aluminum. The wood framing is unique and rustic and reflects the character of the old barn it came from. And best of all, 15% of the profits from each image is donated to a different conservation group. Take a look at the new Barnwood Frames Project, you might enjoy one of these limited edition prints! This project proudly supports the fine work of the Adirondack Council, Adirondack Mountain Club, Lake George Conservancy and the Association to Preserve Cape Cod. They’re here and they look great! Last year’s successful calendar has been updated with all new images from my portfolio. The same FSC-certified fine art recycled felt paper is used again this year. At 11”x 14” they have ample space for writing your agenda while also inspiring you with nature! And best of all, 30% of the profit from each sale is being donated to The Nature Conservancy of New York. Sustainable, low-impact gifts for the outdoors fan that give back to nature, what could be better? So proud to announce my latest project, "Animal Abstracts" to help support Ol Pejeta Conservancy in Kenya! Ol Pejeta is home to the last two remaining Northern White Rhinoceroses as well as other threatened and endangered species. All "Animal Abstract" proceeds are being donated to Ol Pejeta to help support their work. These prints are available in a variety of formats starting at $10 each. For an amazing contemporary display we also offer pre-hung Collage Set options. Check it out in our shop! We are proud to announce that our prints and framed art products are now available for shipping to the United Kingdom, Ireland and much of Europe!